Gamekeepers throughout the Scottish uplands are taking the lead to ensure mountain hare (Lepus timidus) numbers are sustainably managed for the future by implementing a new counting methodology that provides better insight into their abundance. 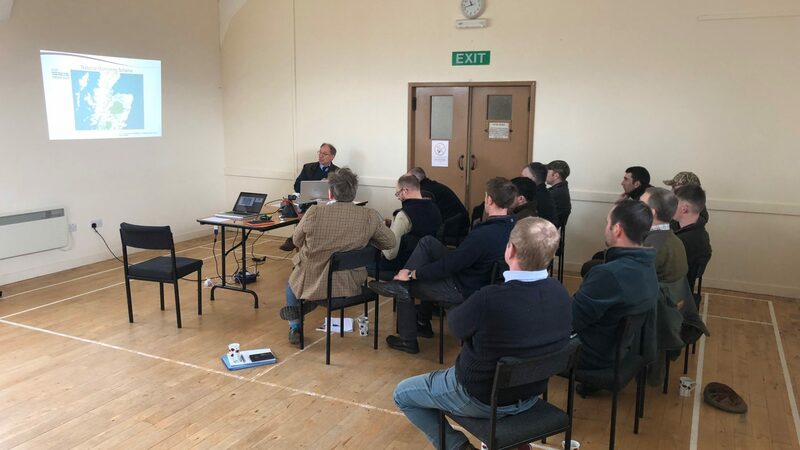 Nearly 70 gamekeepers and land managers across 47 estates have now attended formal training workshops, led by the Game and Wildlife Conservation Trust (GWCT). The courses cover the importance of counting for management planning and conservation, lamp methodology practice, equipment, use of count cards and selection of survey sites. Over 60 sites and 240 transects have already been mapped for repeat surveys. Due to continuing demand, the programme of training workshops will run again in 2019 and be extended to nature reserves and other types of landholding in order to establish a fuller picture of populations on the ground. This new approach has been rolled out following the 2018 publication of a three-year research project that compared different methods of counting mountain hares. The work, undertaken by the James Hutton Institute and the Game & Wildlife Conservation Trust (GWCT), was commissioned by Scottish Natural Heritage (SNH). Night-time lamping surveys carried out using the new methodology in late 2018 are revealing new insights into species abundance. In one case, 102 mountain hares were counted on a single walked transect in the central highlands, whilst another study site (comprising four walked transects) yielded a count of over 200 mountain hares. These results, which point to robust mountain hare abundance on managed moorland, were achieved in much the same areas as daylight counts for the report by the Centre of Ecology and Hydrology and RSPB published in the Journal of Applied Ecology in August 2018 that suggested significant declines in hare numbers. Mountain hares are protected in the closed season (1 March to 31 July) and can only be legally controlled during the open season. Estates carry out mountain hare counts on an ongoing basis to assess populations and a good number of initial counts have already been carried out this year. “We welcome the new methodology guidelines as they set a standard for best practice to be used by all land managers and gamekeepers throughout the country. Being able to easily identify the distribution and abundance of mountain hares in upland areas will give us a true picture about their conservation status in Scotland and allow for informed decisions when carrying out sustainable management.